I suppose everyone is wondering what happened to my declaration last Monday. You know, the one where I was going to blog daily for the month of October? I’ll tell you what happened. Miss Munchkin happened. 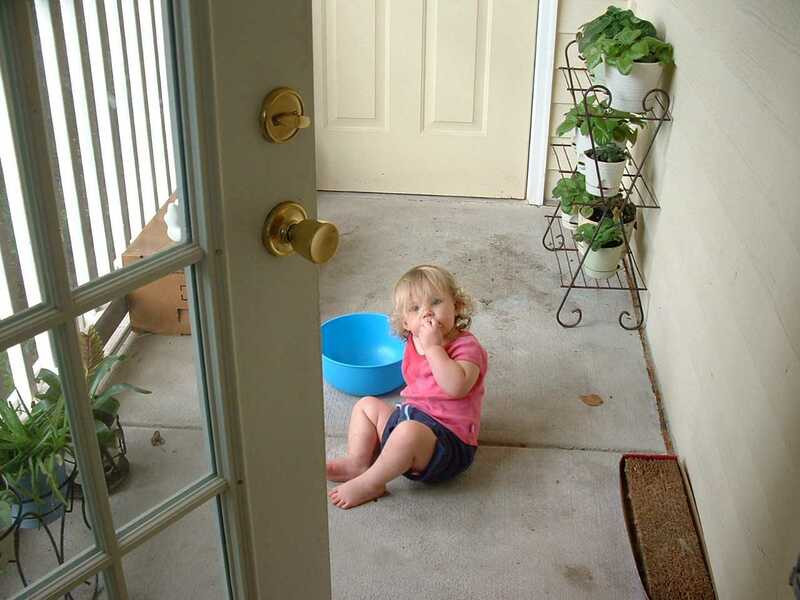 Shortly after I posted my blog entry on Monday, Kat called to see if she and Miss Munchkin could come early and spend a few days, instead of just Miss Munchkin coming on Thursday and staying till Sunday, which was the original plan. Well, what’s a Grandma to say? So they arrived Monday afternoon, then Kat went back home on Thursday and Miss Munchkin stayed here. Kat and Shawn arrived last night just before Miss Munchkin went to sleep and they all left this morning. Wow, is it ever quiet here today! 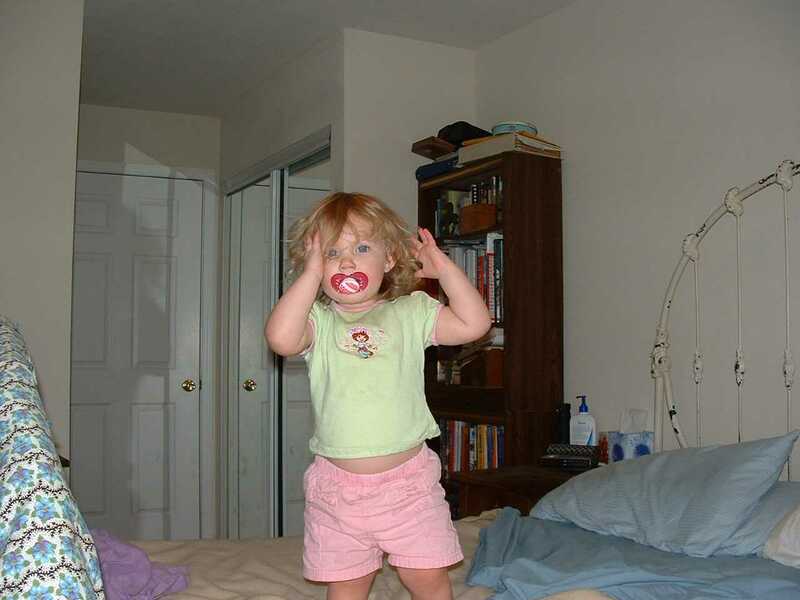 Miss Munchkin is now nineteen months old and she does still take a nap, thank goodness. Sometimes it’s an hour, sometimes longer, but if you happen to be doing a lot of driving around town, like I have been, and Miss Munchkin takes her nap while in the car, that means she is wide awake the whole time at home. Which means that Grandma does not get any quiet time at all! That means no e-mail time, no writing time, no shower, etc. Just getting things like meals and laundry done can be a stunt. I really do not remember my three children being quite that busy as toddlers. I know the older two were not that busy. Maybe Charles was, but by that time he had two older siblings to play with and annoy, so maybe I just didn’t notice it quite so much. But Miss Munchkin definitely is Grandma’s girl and that means she wants Grandma to do everything with her! Thanks goodness for uncles that will play ball with her a bit. What I do remember from those early baby years of my own is how overwhelming babies / toddlers can be, both mentally and physically. Mentally you are on call 24 / 7, always listening for that baby cry, always aware that you are responsible for this little being’s welfare. Even now, after all these years, just knowing that Miss Munchkin will likely wake up in the night means that I sleep ever so lightly, awakening upon the slightest stirring in the next room. Physically my body feels as though it has been through boot camp. And I think it has. This could be a new obstacle course for any military boot camp. Carry a thirty-pound squirming toddler up and down the stairs. 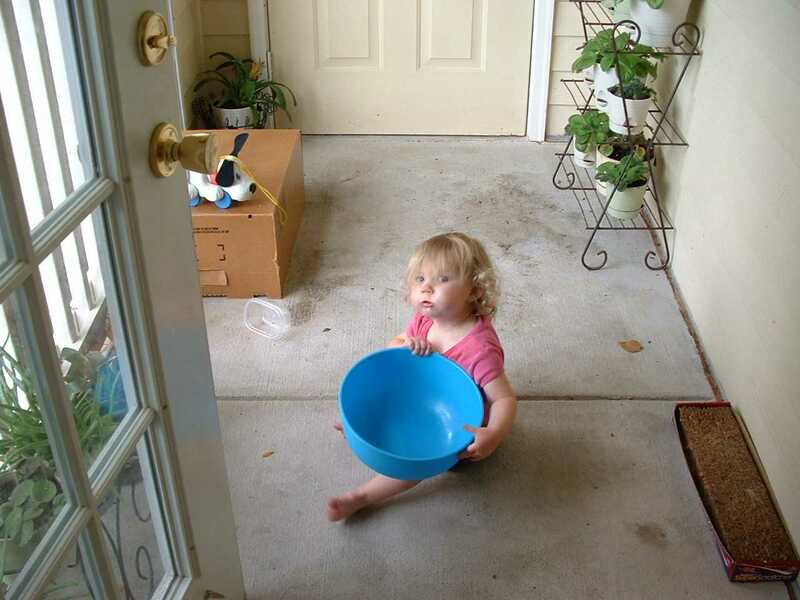 Pick her up whenever she wants “up.” Let her crawl in and out and over and around your lap whenever you sit down. Have her walk on top of your feet whenever you are standing at the kitchen counter so she is taller. Reach quickly to remove items that are now too close to the counter’s edge (she’s grown just a bit taller since her last visit). Bend over to clean up spilled plants. Race to the potty and then the bathtub because the race to the potty was too slow. Oh, and did I mention the constant fulfilling of the “eat” demand as the seemingly ever-hungry toddler pulls at the refrigerator door? Definitely not an obstacle course for the faint of heart, let alone weak of body! Playing Peek-a-Boo on Grandma’s bed. 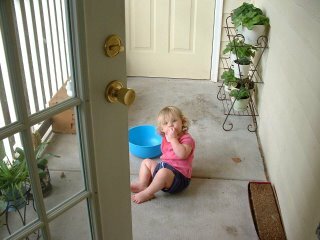 Eating grapes on the balcony, Miss Munchkin’s favorite place to be. Grandpa and I have decided that a two, possibly three-day visit from Miss Munchkin is just the right length. Anything longer than that and Grandma will need a vacation at a spa to recover! Fiona is even cuter than the lats time i saw her. We miss u here at BM! Can’t wait to see you again!! !